Come and see what God has done, was the angel’s message to the shepherds out in the fields watching their sheep that first Christmas night. They were terrified as the angel came among them and the glory of the Lord shone around them. The angel told them not to be afraid, for he had brought them Good News that would bring Great Joy, for all people, for a Savior had been born!! Then the angel told the shepherds how they would recognize the Savior that was born; they would find Him wrapped in swaddling cloths, lying in a manger. How did the shepherds respond to the angel’s message? God’s message pierced through the darkness and rang out loud and clear on the hills outside Bethlehem as a host of angels joined together praising and glorifying the Lord. Their words of praise and of peace expelled the shepherd’s fear and brought an excitement to them to go and see the thing which the Lord had told them about. They hurried off, and there, in the town of Bethlehem, they found the Baby; the Good News that brought Great Joy, the Savior of the world! The shepherds were the first missionaries, the first ones to share testimony about Jesus! Jesus hadn’t said a word, hadn’t done anything but “come to earth.” Standing in the presence of Jesus, seeing what God had done, changed the shepherds and gave them a story they couldn’t keep to themselves! They went and spread the Good News of Great Joy to all the people and all who heard their story were astonished. The shepherds went back to their work that night changed because they listened to and obeyed the message from God. Their darkness was turned to Light as they went to see what God had done! Their hearts were filled with awe and wonder, and their mouths were filled with joy and praise as they glorified God! Though you may not see an angel come to you with a message from God or a multitude of angels praising God, God still sends this message to you. And once you find Jesus, once you see Him face to face, once you experience the presence of Jesus you will never be the same! Whether you have seen Jesus for many years, or have never responded to God’s message to come and see…I invite you to come and see Jesus as never before! Every encounter with Jesus, every time you set aside the busyness of life to come and see, to “Be still and know that I am God,” you are changed from the inside out. A great way to have an encounter with Jesus is to read the Bible with a heart that believes and a mind to understand. Jesus is called the Word of God, so when you read the Bible, you gain understanding of who God is. You learn the Good News of all Jesus has done, is doing, and will do. Your fear is turned to peace. You are encouraged by those who have gone before and have seen what God has done. You gain understanding, new perspectives, and greater faith. Your mouth is filled with praise and you have stories that you can’t keep to yourself! Between the Old Testament and the New testament there had been over 400 years of silence. No one had heard the voice of God. It was into that darkness that the angel’s messages to Zechariah, to Mary, to Joseph, and to the shepherds came shining through. It was into that silence that God sent His Good News of Great Joy, the Savior of the world. Sometimes you can fool yourself by thinking that because you have a Bible in your house. Because you go to church. Because your family is Christian. Because you have the Light of Jesus all around you, you don’t need to have your own encounters with Jesus. You can be fooled into thinking that since you heard the angels tell about the Savior of the world you don’t need to go to the manger to see Him for yourself. The truth is that until you push away your own fear, leave your own sheep, and hurry off to find the manger, you will never encounter Jesus. You won’t experience His presence, and you will live in darkness and silence. You will be one who brings God’s message of Light into this dark world, breaking the silence with His message of Hope, a Savior, who is Christ the Lord! Feel free to share a comment of your encounters! You never know how your story may encourage someone else! 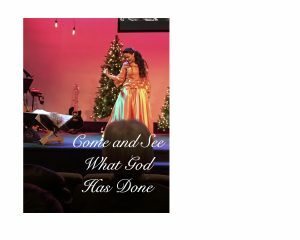 A beautifully choreographed dance to the song, Noel, written by Chris Tomlin, performed Christmas Day, at Bethany Church, Wanaque. Posted on December 28, 2016 December 28, 2016 Categories Blog PostsLeave a comment on Come and See What God has Done! When God created the first man He called all of heaven to join Him as He gathered the dust of the ground and formed and shaped Adam with His hands. Jesus, Holy Spirit, and all the angels watched in amazement as God then leaned over and breathed His very breath into man’s lungs and Adam became a living being. The woman too, God took His hands and reached into Adam and drew out a rib with which He formed Eve. All other creation God spoke into being, but man was lovingly shaped by God’s very own hands, created in His own image. Adam received his first breath through God’s own mouth. God placed Adam and Eve in a garden of perfection, the Garden of Eden, where they all enjoyed walking and talking together. Adam and Eve had everything they needed, experienced no guilt, and knew no shame. That was all Adam and Eve knew; perfect love, truth, and intimacy with God, their Creator. Satan, the liar, brought to God’s creation another voice. Satan had also enjoyed the presence of God. Lucifer, as he once was called, was created by God, a beautiful covering angel who worshipped God and walked upon the fiery stones of heaven. But one day evil was found in Lucifer. One day pride rose up in him and he wanted to be worshipped instead of the worshipper he was created to be. He wanted to be like God. And because God will not share His glory with any other, Lucifer was cast out of heaven, down to earth. And so, it was this same evil that came into the perfect Garden of Eden. Sin brought guilt and shame. Sin brought death to the relationship between man and his Creator. That evil, that sin nature, has been passed on to all God’s creation. God had a plan from the beginning, when sin first entered man. That plan was to restore relationship, and to defeat the enemy, the liar, Satan. There in the Garden of Eden God set His plan into motion and there is a Crimson Thread that runs through the Bible that shows God’s love for His creation. It was a plan of redemption so that the relationship and the fellowship that God intended for His creation would be restored. Love came down from heaven on Christmas Day! The prophet Isaiah spoke of a child, a son that was to be born. He would be called Wonderful Counselor, Mighty God, Everlasting Father, Prince of Peace. He would rule with fairness and justice, forever. The Lord of heaven’s armies would make it happen! (Isaiah 9:6-7) Isaiah spoke of this 700 years before the birth of Jesus. God gave His people a promise, a hope, that He had Good News that would be to all people. On that first Christmas night I believe a holy hush fell upon heaven, as all joined together and waited in suspense, in anticipation, to see the Wonder of Love sent down to earth! Love that would once again breathe life into God’s creations that had died that day in the Garden of Eden. Love that would restore relationship between God and all whom He lovingly created with His own hands. Something new and different was about to happen. God’s Love was about to be demonstrated in a miraculous way. The Love of God was about to come to earth, to take on flesh and blood, to live among the people. Jesus came down at Christmas, born to bring us Life! God’s Love is Good News!! God’s Love casts out all fear!! God’s Love brings great joy!! Why the shepherds? Why were they the first ones to hear the Good News? Those who were outside and alone on a cold dark night, doing a menial job, away from the warmth and comfort of home? In many ways the shepherds represent all people. Sin has kept us outside, and alone in the dark of night. Sin has kept us away from the warmth and comfort of a relationship with our heavenly Father. God’s Good News is for all people! You may be far from the warmth and comfort of family and friends. Christmas! The Love of God come to earth as a Babe in a manger. The Light of God come onto this dark world. The Life of God given to all who believe. This Christmas may you know the Good News that came to the shepherds on that first silent and holy night…Good News of Great Joy, a Savior is born, He is Christ the Lord! No longer a Babe in a manger, but the Savior of the world who now sits at the right hand of God the Father. He no longer knocks on the doors of houses, but on the doors of human hearts, longing to be welcomed inside to bring Love, to bring Light, and to Live with you forever! “Hear the Good News of Love come down at Christmas! For I so loved you that I sent My One and only Son. If you believe in Him you will not die, but you will live and have Life with Me forever! The moment the Living Nativity came together with all the cast gathered around a baby doll laying in the manger I was in awe of how God had once again kept His Story alive. I realized that what seemed a simple script, roughly cut and sewn costumes, and a stable made from left overs and scraps of wood, held within it the wonder and awe of God come to earth! What I have learned is that God doesn’t mind the simple script, after all, it is His Word being proclaimed. And I don’t think He minds the roughly sewn costumes, because they are similar to the swaddling cloths He was wrapped in. 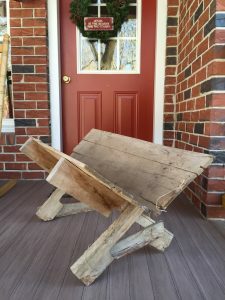 And I’m quite sure He really likes the creative way a soccer goal is transformed into a stable. 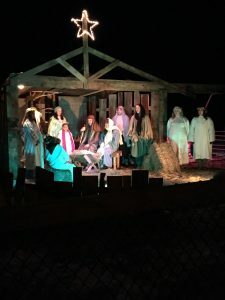 But last Saturday night I was humbled as I stood and listened to the simple script, looking at the cast wrapped in swaddling costumes, all huddled together in the hand crafted stable, and I asked God’s forgiveness for my doubts about doing the Living Nativity. At that moment my excuses evaporated into the cold night air at the wonder of God’s Word being proclaimed to all who were there. My doubts seemed so insignificant as I watched the cast act out the Story of God come to earth as a Babe in a manger. I am reminded that no other words could tell the Christmas Story better than God’s own Words. There is power in the Word of God and as it is spoken into the cold night air it is as seed falling on the hearts of men filled with the love and power to save and change lives forever! The Babe in the manger is the “Word of God” come to us, and because He came, lived among us, died for us, and rose again, we have been given the greatest gift; the gift of life! I am reminded that Jesus wasn’t born to a wealthy family. His parents hadn’t packed Him a new, finely made outfit to wear when He was born. Love was wrapped in swaddling cloths. God gave the greatest gift ever given when He sent His Son, Jesus, to earth. Jesus wasn’t wrapped the way many believed the Messiah, the Savior of the world, would be wrapped. His “wrapping” didn’t line up with what they thought their Savior should look like. Things haven’t really changed. Today, many don’t receive Jesus, the gift of God, because He isn’t wrapped the way people want Him to be wrapped. Too often we define the Gift of God by the wrapping we see, rather than by opening up the swaddling cloths and seeing the greatness, the love that lies within! I am reminded that Jesus humbled Himself when He left His throne in heaven and came to this earth. He wasn’t born in a palace, a mansion, not even in an Inn. Love was born in a stable. God’s timing is perfect; yet there was no room for them in the Inn. If Mary and Joseph had arrived earlier there would have been room. God could have reserved a room for His Son. It was God’s will for His Son, Jesus, to be born in a stable. May I realize the power of proclaiming God’s Word to those around me this Christmas. Holy Spirit, open my eyes to the needs of those around me and give me the boldness to share Your Words of Truth that have the power to save and to change lives for eternity. May I know the greatness of God by embracing His “Gift of Love” wrapped in swaddling cloths. Jesus, I want to know You more, may I experience Your love, and be filled with Your love, so that I can share Your love with others this Christmas. And may I have the same humility as Jesus, who came to serve, not to be served this Christmas. Father, Your timing and Your positioning is perfect. May I trust You even when I don’t understand my circumstances. Even when I feel I deserve an Inn and I end up in a stable. May I be willing to die to myself so that Your will is done. May I be willing to lay aside my rights so that others will see You. 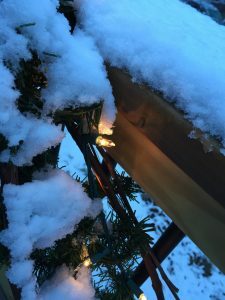 The snow this morning was beautiful as it blanketed the trees and the Christmas lights and I thought, “Its beginning to look a lot like Christmas.” Snow and Christmas lights…what is it about them that makes it look like Christmas? How do you describe Christmas? What determines your definition? Christmas, the original meaning, is the commemorating of the birth of Jesus. This is what I want Christmas to mean to me. This is how I want to see Christmas, how I want to describe Christmas. Yet, this word “now” has me caught up in celebrating a holiday that is all about exchanging gifts. These traditions are wonderful and provided many great memories. I am thankful that I have kept Christ in Christmas. I am thankful that many of our family traditions have included the celebration of the birth of Jesus…but there is this word “now” that has me wondering if I have really seen Christmas, truly celebrated Christmas commemorating the birth of Jesus, my Savior, and my King. It’s not condemnation…but it does cause me to do some heart searching. How has the celebration of the birth of Jesus, “Wonderful, Counselor, The Mighty God, The Everlasting Father, The Prince of Peace,” now become a holiday that is about a man in a red suit bringing gifts on a sleigh drawn by eight tiny reindeer? The enemy has subtly replaced the truth with the pleasures and lusts of this world to distract us and blind us. The celebration of the true meaning of Christmas holds within it the power to change lives for eternity. How does God see Christmas? Jesus, the Light of the world, humbled Himself, left His throne in heaven, and came to this earth that was lost in darkness. Jesus took on flesh as a Babe in a manger, fully God, fully man. Jesus, the Savior of the world, came and walked the dust of this earth, the very dust He created us from, to save us from our sins, to give us life with Him forever! This is exactly what our enemy doesn’t want for us. He has been eternally expelled from God’s presence and he means to keep as many of God’s creations from Him as well, distracted, blind, and walking in darkness. So what better strategy than to steal the very celebration that holds within it the power to shine the Light of Jesus into the darkness, the power of a Savior to save souls for eternity, the power to reveal God has come to earth, Emmanuel, God with us? That little three letter word, “now” represents the subtle ways the enemy has redefined Christmas. I see that I have conformed to ways the world celebrates the holiday of Christmas. Busyness keeps me distracted from shining the Light and Love of Jesus with others. Focused on the expectations of myself and others has me blinded to those who need to know the Saving Power of Jesus. It is my prayer this Christmas that the Lord would show me how He defines Christmas. What does Christmas look like to Him? How would He have me to celebrate the birth of His Son, Jesus? for the salvation of many! Lord, Thank You for Your incredible love for us that sent Your Son to earth as a Babe in a manger! Thank You for the Light that You have shined into our darkness so that we could see our sin and receive salvation through faith in Your Son, Jesus. You have given us the most incredible gift ever given!! Lord, show us how to celebrate the birth of Your Son. Show us how You see Christmas. Jesus, You came as the Light, but now You have said that we are the Light of the world. Empower us with Your Holy Spirit to shine Your Light into the darkness around us so that others will see and know You, the true meaning of Christmas! There is another tradition that our family has had the privilege of doing with friends for many years. It started over twenty years ago when Mark and I gathered our small group families together, put on robes, and read through the Christmas Story. We began at our house when the angel came to Mary. Then Mark lead our horse, Buck, with me on his back up to the barn where we found no room in the Inn, but were given a stable in which baby Jesus, a teddy bear wrapped in a swaddling blanket, was placed in a hand made manger. The story ended by playing, “Mary, Did You Know?” It was the beginning of a tradition that grew as our small group families joined together and made it bigger and better every year. After many years as our children grew older the costumes and props were left untouched in the basement for several years. Then when our daughter, Kayla, was eight, God prompted me to get out the costumes and the props and He breathed life back into the Living Nativity. Today as I write this I am reminded of the truth of what I just wrote…there is a battle for the celebration of the true meaning of Christmas. The battle of my will. The battle of no cast. The battle of no support roles. The battle of no practices. I’m so thankful that God fights my battles. That I can look to Him and trust that He will see that His Story goes out. its about God coming to earth, Emmanuel, God with us! I invite you to come and join us as we celebrate the true meaning of Christmas! 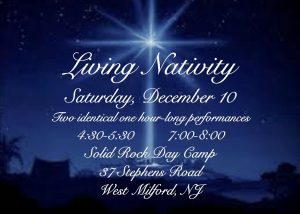 The Christmas Story told through narration, drama, and song. Two outdoor, hour-long, performances. Followed with hot chocolate and cookies! Posted on December 7, 2016 Categories Blog PostsLeave a comment on What Does Christmas Look Like? Back to Joseph who was left in prison… The cup bearer to the king had forgotten all about Joseph. He hadn’t given Joseph another thought once he was set free. Two full years later Pharaoh had two dreams in one night that distressed him greatly. He called his magicians and wise men, but no one was able to interpret the dreams. This was what reminded the cup bearer of Joseph. He remembered when he too had a disturbing dream that needed to be interpreted. He told Pharaoh about Joseph, a prisoner, who had interpreted his and the chief baker’s dreams accurately. So Pharaoh immediately called for Joseph. After Joseph shaved and cleaned himself up, he was brought before Pharaoh. Pharaoh said to Joseph that he heard he was able to interpret dreams. Joseph was quick to say that it wasn’t within his power, but it would be by the power of God alone that he would tell Pharaoh the meaning of his dreams. Seven fat, healthy cows were eaten up by seven skinny, sick-looking cows, but they still looked sick and skinny. Seven beautiful, full heads of wheat were eaten up by seven dried out, withered heads of wheat, but they were still dried out and withered. Joseph told Pharaoh that the two dreams had the same meaning, and because he had the dream twice it was sure to happen. He went on and explained that the seven fat, healthy cows, and the beautiful, full heads of wheat represented seven years of plenty. The seven sick-looking, skinny cows and the dried up, withered heads of wheat represented seven years of famine. God not only gave Joseph the interpretation of Pharaoh’s dreams, but He also gave Joseph wisdom and understanding how to handle the years of plenty so that during the years of famine the nation would be saved. clearly no one else is as intelligent or wise as you are. I hereby put you in charge of the entire land of Egypt. For thirteen years Joseph faced a pit, slavery, and prison where the enemy meant to steal his dreams through offense, bitterness, and unforgiveness. He meant to kill Joseph’s identity and redefine him through deception. He meant to destroy Joseph’s destiny, by keeping him locked in fear and shame. But Joseph himself had two dreams many years before. Two times which meant they were sure to come true! They were God dreams – dreams that stayed with Joseph – no matter what the enemy threw at Joseph, no matter how much time passed, he never let go of his dreams. to carry out the dream God placed in his heart thirteen years before! What are the dreams has God given you? Has God given you a dream that seems impossible? A dream that is way beyond your understanding, or ability? Has your dream faded because it was so long ago? Or has the enemy stolen your dream through offense, deception, or disappointment? The thing about God dreams is that when you receive the dream, you aren’t ready for the dream to be fulfilled. The time between is just as important as the actual fulfillment. May this story of Joseph bring you encouragement today. No matter how long ago you received a God dream, no matter whether you are in a pit of offense, enslaved in deception, or in a prison of self, God is there with you and remains faithful to His promises. He will enable you to thrive even in the difficult places. God will never leave you, or give up on you. and will always give you the ability to overcome everything you face. Ability to forgive any wrong done against you. Forgiveness sets you free from your pit. Nothing done against you is worth holding on to. Forgiveness makes the difference between staying in a pit or realizing the fulfillment of your dream. Ability to serve others. Jesus lived a humble and selfless life and He called you to do the same. To die to self, to put aside your desires, your hurts, your disappointments, in order to serve others, prepares and equips you for the promotion of your dream being fulfilled. Ability to know things, to do things, and to say things beyond your own understanding. God has given you His Holy Spirit as your counselor, your guide into all truth. Not only will He empower you to forgive, and to serve, but He will give you the supernatural understanding and wisdom you need to encourage, and to impact others around you as your dream becomes a reality. Trust that the time between, though it is meant for your harm, is actually intended for your good, for the salvation of many.